A New baby is a perfect bundle of joy that fills your home and life with happiness and delight. New baby’s arrival is a special occasion and you can make it extra special by sending new baby cards to congratulate and share the happiness of new parents. You can add a special touch of love and affection to your new born baby cards by designing them with greeting card studio software. These personalized new baby cards will be loved by the recipients. 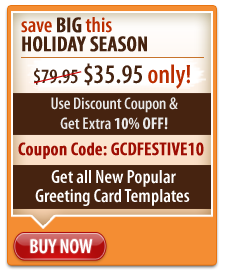 This greeting design software is easy to use and enable he users to design a card exactly matching their needs. Use a popular combination of two colors to make the new baby card look adorable. You can add the photo of new baby to make a greeting for new born baby that will be treasured forever. You can personalize the greeting for new baby by adding the details related to date of birth, time of birth etc to create special memories that will be retained forever. You can either print these new baby cards or send them to your loved ones via email. You can also share them instantly on Picasa, Facebook and Flickr. Get your copy of greeting card software now and express your feelings and love for the new born baby in a personalized way.